Protesters storm Iraq parliament Jump to media player Shia protesters have broken into the Iraqi parliament in Baghdad, demanding that a new cabinet is voted in. Iraqi PM 'to address political crisis' Jump to media player Iraq's Prime Minister is expected to attempt to end the country's political crisis with a cabinet reshuffle. British train Iraqi army for battle Jump to media player British military advisers are training the Iraqi army for a battle against so-called Islamic state in the city of Mosul. Refugee family reunited with missing cat Jump to media player A family who left Iraq to find a safer life in Europe have been reunited with their cat who they lost on the way. 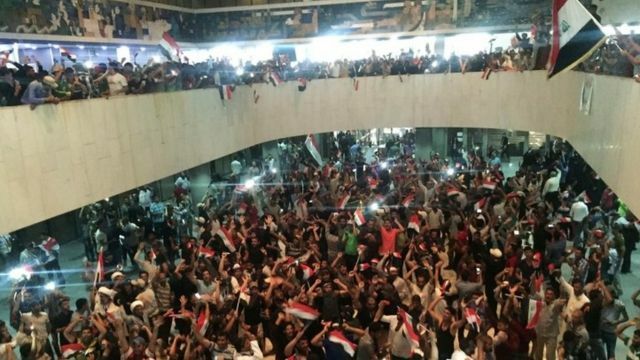 Protesters have broken into the Iraqi parliament in Baghdad, demanding that a new cabinet is voted in. They were among hundreds of supporters of the powerful Shia cleric Moqtada al-Sadr who broke through the gates and tore down the protected Green Zone's walls after politicians again failed to convene for a vote on the new ministers.